On February 14, 1789, 17-year-old Robert Stockton and his friend, Beechum Rhodes, decided to go bear hunting. Robert wanted to obtain enough skins that could be traded for salt, sugar, coffee and gunpowder and other things his family and others at Stockton’s Station could use. A year earlier, Robert's family had been the first to settle at Stockton's Station, on the outskirts of present-day Flemingsburg, and with his father, George, away on business, Robert saw this as an opportunity for him to shoulder some of the responsibilities of both his family and the community. A light snow had fallen the first day of the hunting expedition, and this aided in the successful tracking and dispatching of several large brown bear the second day. Unfortunately it also revealed the trail of the two young hunters to a small group of raiding Indians, who followed the trail. Soon, the hunters would become the hunted. After Robert and Beechum had finished preparing the bear hides, they built a fire and fell asleep. Likewise, the Stockton family’s two loyal hunting dogs, who had accompanied the young men on the hunting trip, curled up next to Robert and fell fast asleep. The dogs had always done their part to protect and help provide for the family, and of course they also served as blessed companions. In the darkest of night, the small band of Indians, who had been watching the boys that day, crept up to within feet of the campfire and simultaneously fired their muskets several time into the two sleeping boys. The effect was devastating. Robert only managed to grab his musket, stand and point his weapon before falling to the ground dead. Beecham was shot twice in the upper portion of his right leg, near the groin, but was able to crawl into a nearby creek, where he fought to remain conscious, but remained alert enough to avoid drowning and avoid being killed. If the Indians thought they had made a big score, they were wrong. Just as the shooting ended, they were savagely attacked by the dogs. The attack was so vicious and so severe that all the indians had time to do was steal the horses and run away. Eventually, Rhodes passed out from a loss of blood. When morning's first light came, he was able to stop his wounds from bleeding. But he could not move his right leg. Slowly, he began crawling toward Robert’s body. One of the dogs way lying on top of Robert's body and growled savagely at Rhodes as he drew near. The boys' muskets lay near Roberts body, but there was no way for Rhodes to reach them for fear of being torn apart by the dogs. He was alone in the wilderness - 15 miles from Stockton’s Station - without weapon, horse or food, and worse...he was unable to walk or even stand. With a fierce determination, Rhodes took the only course of action available to him. He began to crawl towards Stockton Station. Slowly, he began dragging himself forward using his hands and one good leg, refusing to quit and accept his death. He continued at his pitifully slow pace for seven days and nights, never stopping for fear of being unable to continue if he ever did. 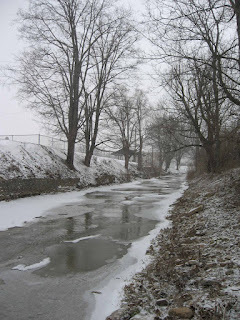 On the evening of the seventh day he had crawled to within one mile of home, but was forced to stop as the banks of Fleming Creek, which lay between him and his destination, were flooded. It was there that Beechum Rhodes stopped trying and accepted the fact that he was going to die. He was very near death when Samuel Reed, a hunter from Stockton's Station found him. Reed immediately picked him up, swam the flooded creek and carried him the remaining mile to the station. By this time, Robert’s father, George, had returned from his trip. He and others rode out to the boys’ campsite to bury the son of their leader and their dear friend. They found the boy where he had fallen. At the campsite, the dog, which had been lying on top of Robert when Beechum crawled away, was still faithfully lying on top of him. A circle of earth around the body was torn and scratched. That, and a number of wounds on the dog, made it evident that the dog had protected his master from several wolf attacks. 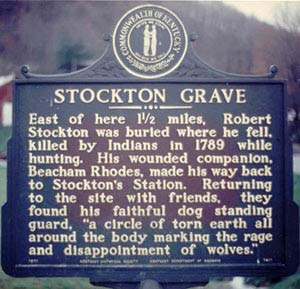 The body of Robert Stockton had not been touched by the wolves. The poor dog was out of its mind with pain and misery, and would not listen to anyone’s commands, but still tried to protect the boy's body. After several attempts, Robert's father was able to remove the dog from his sons body. After burying Robert, his dad and the others began their sorrowful journey home. The sight of Robert’s father slumped in his saddle, sobbing and gently stroking that poor bloody dog as he rode along, was more than even the roughest among them could bear. The lamentations of both dog and man echoed through the ancient forest that day. Beechum Rhodes eventually became a militia scout. The two dogs lived the rest of their days as heroes. Today, the place where Robert Stockton was killed and buried is known as Stockton Creek.